With the exception of 1 day a month when you pay your electric bill, chances are that you don’t give a lot of thought to your electrical system at all. In fact, you may even take it for granted, absentmindedly plumbing in items like your hair dryer, phone, and laptop charger all at once, never expecting that it will be an issue. So, if you find an electrical outlet not working, it’s likely pretty frustrating. Additionally, it could be the sign of a serious Spokane, WA electrical repair service need. But what exactly is it that causes failed or faulty electrical outlets? Tripped Circuit Breaker: It’s fairly common for a single circuit breaker to trip on occasion, causing the outlet associated with it to stop working. Check your electrical panel, and reset any breakers that shut off. An important factor to remember in this scenario is that when a circuit breaker trips, the knob doesn’t always flip to the opposite side—it can get stuck near the middle. If you have constantly tripping circuit breakers, then there’s a good chance you’re overloading them. Check to see if you can unplug some items in your living space. Better yet, talk to a professional electrician about upgrading your electrical pane so your home can handle the increased electrical demand you’ve placed on it. 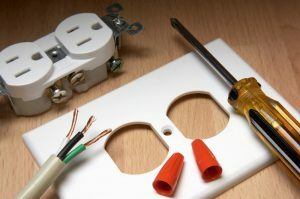 Tripped GFCI Outlet: GFCI stands for ground fault circuit interrupter, and modern building codes require that outlets near sinks or any other source of water either be GFCI or be protected by one. When this type of outlet detects an electrical short or it overheats, then these outlets will shut down on their own, rather than causing the circuit breaker to trip. If an electrical outlet in your bathroom or kitchen stops working, reset all the GFCI outlets in that room, since a GFCI that pops will also cause all outlets further along the same circuit to cease working. Aging Electrical System: One possible reason for electrical outlet going bad is due to contacts becoming loose, to the point that the entire outlet needs replacement. This happens most often in older homes that haven’t had their wiring updated in years (in which case, you should also consider an electrical panel upgrade). Since electrical work is inherently dangerous, we’d advise leaving any repairs to a professional electrician. As you can probably guess on your own, failure to shut down the right outlet at the electrical panel before starting electrical work can result in a serious injury and damage to your home. ACI Northwest is here to help with your home comfort needs or concerns. Please do not hesitate to contact us for helpful advice and to schedule any electrical services you may need.